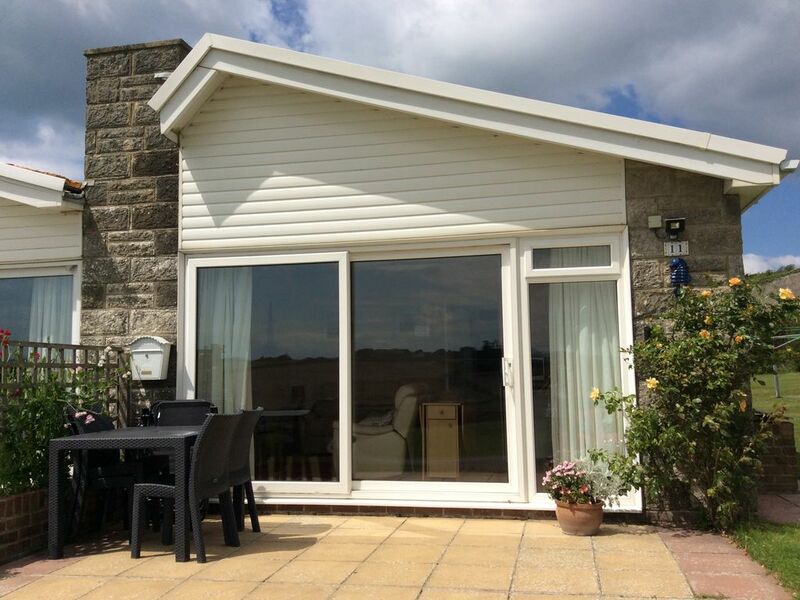 Idyllic seaside bungalow set in Linstone Chine Holiday Village at Cliff End Freshwater on the beautiful Isle of Wight. Free, unlimited Wii fii is available at this property. The two bedroomed bungalow is brick built with bathroom with bath and shower. The kitchen and lounge are open plan and the lounge area has a t.v. with recorder. Outside the bungalow is a patio area with patio table and four chairs with parasol if required. The accommodation sleeps 4 and is comfortably furnished and well equipped for all your needs, a real home from home. The bungalow enjoys breathtaking views overlooking beautiful countryside to the front and out over the sea towards the needles, to the side of the bungalow. The village of Freshwater is a short drive or about a 15 minute walk away. The very popular town and ferry port of Yarmouth, where there are several very good pubs, restaurants and cafes, is approximately a 30 minute walk. The beach can be seen from the side of the bungalow and takes just five minutes to reach by walking through the holiday site to the slip-way. A short way further up the beach are cafe and beach side bar and restaurant and traditional bucket and spades and ice cream for sale. From the beach sit and watch the boats sailing by and enjoy the lovely view of Hurst Castle across the water. Lovely family holiday. Easy access to a lovely quiet beach and coastal walk to Victoria Fort country park. The more times we visit the more we love it. So glad you enjoyed your stay, it was a pleasure to have you. Would definitely use it again. The views are very nice. Clean and complete house. We had a nice stay. Thank you.